On the eve of Bahrain's National Dialogue, whose first substantive sessions will begin tomorrow, Al-Jazeera is reporting a very peculiar story. It is based on a "leaked" report outlining the findings of an official study purportedly commissioned by the Bahraini government in the second half of 2010. What is this study, you ask? A study of the ethno-religious (Sunni-Shi'i) composition of Bahrain. As one of the notable results of my 2009 mass survey of Bahrain was precisely this--a first direct estimate of the ratio of Sunni and Shi'i citizens in Bahrain since the country's very first census in 1941--naturally I was intrigued by this new government "study." And a bit surprised. For, according to the Al-Jazeera summary, the government study found that Bahraini Shi'a comprise a slight minority of the country's population, at 49%, a figure quite removed from my own estimate of around 57.6%. the document emphasizes that the procedures for naturalization did not influence the sectarian division during any period by more than 1%, because it was limited and conducted in accordance with the conditions set for citizenship. the document shows that the primary beneficiary since the [new] Bahraini citizenship law passed in 1963 are wealthy Persian Shi'is and not the followers of the Sunni sect. The document adds that, after he took power in March 1999, King Hamad ordered the return of exiled citizens abroad, and the number of returnees with their families during the period from 2001 to 2003 [amounted] to about 10,607 citizens, mostly of the Shiite community. the lack of accurate and scientific data [has led] many international institutions, foreign governments, and the media to believe for 20 years that the demographic distribution in the Kingdom is divided into a Shiite majority (60% -70%) and a Sunni minority (30% -40%). But they were wrong! And this leaked government report proves it. Yet a few things make one suspicious of such results. In the first place, the timing and content of the leak are simply very convenient. One day before a contentious national dialogue is to begin in which a Shi'a-dominated opposition is poised to demand substantive political reform in large part on the basis of their majority demographic status, we have a leaked report saying that "Oops, you aren't a majority after all! And by just one percentage point!" The government has never engaged in political naturalization. Indeed, if anything, Bahrain's generous naturalization policy has done more to bring Shi'a to Bahrain, not Sunnis. Thus, not only are Shi'a misguided to claim political disenfranchisement on majoritarian grounds and as a result of political naturalization, but the only reason they have reached even their current demographic status of 49% of the population is the government's liberal immigration policy. The other suspicious thing about the findings of the study are its procedure, as reported by Al-Jazeera. The latter tells that the study was based on "analysis of historical documents and studies and field surveys"; records of the Sunni awqaf (religious endowments); family and marriage records; religious conversion records; and "data from the intelligence and security services." Now, the agency said to have conducted the survey, the Central Informatics Organization, is Bahrain's main statistical agency. Formerly attached to the National Security Apparatus, it was once (and perhaps still is) the equivalent of Bahrain's CIA, and, as Al-Jazeera notes in its summary, it operates today under the direct supervision of the prime ministership. Given this background, and the fact that the CIO is the agency responsible for carrying out Bahrain's census, the notion that it would resort to "analysis of historical documents and studies," marriage records, and so on, is a bit difficult to understand. In reality, all it need do is take a random sample of its own census data; determine (assuming it does not record it already, which is questionable) Sunni/Shi'i affiliation on the basis of family names and geographical location (which for 99% of cases should do the trick); and voilà. Or, at the very least, it could conduct its own field survey of 1,000 random households. In sum, why bother attempting to extrapolate from historical records and marriage certificates if it already possesses exactly the data it requires? Furthermore, without divulging too many details, my own 500-household sample for my Bahrain mass survey came also from the census data of the Central Informatics Organization, if in a roundabout way. It is this therefore strange that just one year prior to this "study" undertaken by the CIO, and using its own census data, my Sunni-Shi'i estimate should differ by some 8 percentage points from that of the CIO's study. And I'm sure I would find more if I cared to look back further through the logs. Suffice it to say that the Central Informatics Organization is keenly aware of the findings of my own Bahrain survey, and presumably were not happy to see its results made public. While this is not to say that its study (or the "results" of its study) were leaked specifically as a counterpoint to my own work, it is also not unthinkable in light of the government's current PR blitz. The natural next step, then, is to question the extent of the Shi'i population more generally. For if al-Wifaq represents only a particular subset of Bahraini Shi'a, and Bahraini Shi'a themselves represent a minority of the population, then it makes the National Dialogue's soon-to-be lack of substantive political progress a bit easier to sell to international observers. If Al-Wifaq's political demands represent those of a relatively insignificant minority of the population, it is that much easier to dismiss them as one set of political preferences among many. Which, at the conclusion of the National Dialogue--and after the month-long break of Ramadan and 'Eid--King Hamad will surely do à la 2001. To end, finally, on an unrelated note: everyone's favorite Al-Watan columnist Yusif Al Bin Khalil has given up on his ever-popular anti-U.S. series "Washington and the Sunna of Bahrain" to begin a new series with (if you can believe it) an even better title: "Ayatollah Obama and Bahrain." Now from al-Hidd. Seriously, how many offices does the CIO have? Update 2: an article in Al-Ayam now cites a CIO official as denying the Al-Jazeera story and indeed denying the organization's ever having undertaken a study of Bahrain's ethnic demography. (Al-Jazeera itself is also now reporting the denial.) "The source expressed surprise at the timing of such rumor-mongering, with the Kingdom of Bahrain preparing to enter into a dialogue of national consensus, which suggests an attempt to raise issues [at the dialogue] relating to [political] naturalization." So it seems the government is somehow spinning this leaked "report" as a propaganda attempt on the part of the opposition rather than by it. Well played, sir! Update 3: for English readers, the Gulf News now has a good summary of the report and the CIO's denial. 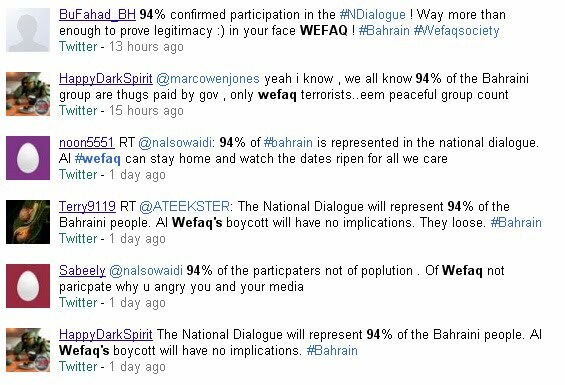 So how did wefaq get 57% of the votes cast in 2010 election as per official statistics and add to that Shias in non Wefaq districts, they think people are fools? Excellent analysis. The government of Bahrain is making a fool of themselves, publishing this so called " leaked document" at this time to allege that after all, shia are not a majority in Bahrain. Not that this gives them the right to oppress them! A simple answer would be free election with a vote to every citizen system. But isn't that the point? If it were published in Al-Watan everyone would just say, "Yeah, but it's in Al-Watan. Of course they would say that." I've been reading over the political naturalization issue in Bahrain. From what i've read the indigenous are about 600,000 and foreigners are 620,000. Still how many of these are naturalized to marginalize the shias and how many are simply workers who aim at going back home when they are done. Some say the Bahraini government is naturlized 10,000 some say 300,000. What did your census show? The 620,000 "foreigners" (I assume this is from the 2010 census) are generally-speaking not part of the political naturalization discussion. These are, as you say, laborers from south asia who come to Bahrain to work and not for the promise of citizenship. The political naturalization issue revolves around Arab and non-Arab (mostly Pakistani) Sunnis brought to Bahrain expressly for work in the security services (as opposed to, say, road construction). Since my survey was administered at a specific point in time it is unable to identify who is and who is not a naturalized citizen. My findings simply show that the ratio of Sunnis to Shi'is in Bahrain is less titled in favor of the latter than is commonly assumed, suggesting that political naturalization been successful in changing the country's ethno-religious balance if we assume that Shi'a peaked at somewhere between 60 and 65% of the population (due to disproportionately high birth rates) in the decades after Bahrain's 1941 census and up until around 2000. It looks as if the Bahraini Government are eager to make themselves look very foolish! Their propaganda comes over as the actions of desperate people in a corner, who are digging themselves into a deeper and deeper hole. The problem is they are harming bodies and souls of hundreds of people, whether Sunni or Shia, while they do this. All the government's offices use a central connection to the internet through CIO. The visits could be from any government ministry, agency, etc. Thanks, Hamad. That certainly makes sense. I don't think it changes the point, though. Actually Hamad is incorrect. This may be correct for some but the Ministry of Defense (BDF) and Interior (MOI) use a variety of ADSL connections through Batelco. Hell, the BDF doesn't even have an email server so everyone there has to use Hotmail, Gmail or Yahoo. The Dialogue is Dead. Long Live the Dialogue. Al-Wifaq to National Dialogue: "We're Out, Baby!"